Delicious food doesn’t have to take a long time to prepare. Here are 15 healthy meals that you can make in 15 minutes or less! 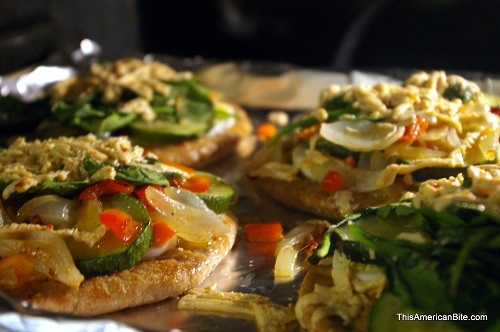 Resolved to eat healthier and cook more often in the New Year? It may seem like a big lifestyle change, but know that it doesn’t have to be a big time commitment. These well-balanced breakfasts, lunches, and dinners can be prepared in just 15 minutes or less. It only takes a little forethought in the grocery store to ensure you have the necessary ingredients on hand, and a smartphone app like Out of Milk will help you keep shopping lists at the ready. Pancakes are popular on brunch menus, but they’re also a cinch to make at home. Plus you can sub protein powder for some of the flour, making them sneakily well-balanced. Combine 1/2 cup quick oats with one cup water and microwave for 1 1/2 minutes; allow to cool for 2–3 minutes. Beat in 1/2 cup egg whites until well combined. Stir in 1 scoop unflavored whey protein powder, 1/2 mashed banana, 1/3 cup blueberries, and 2 Tbsp. PB2; sprinkle with cinnamon. Heat 2 tsp. 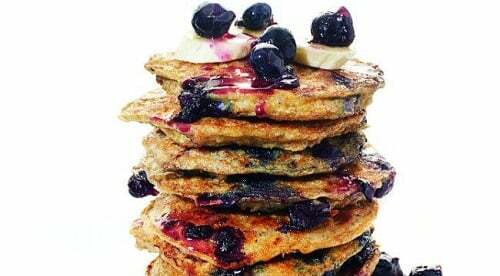 coconut oil in a large frying pan and spoon batter into pan to make two pancakes. Flip when bubbles rise to the top. Serve warm, careful to go light on the toppings (not included in nutrition facts). Maple syrup contains zinc and manganese, but it also packs 12 grams of sugar per tablespoon. A good parfait will run you $4 or $5 in a grocery store or café, but it takes only a handful of minutes – and of your favorite granola – to make one at home. First, mix together 6 oz. plain non-fat Greek yogurt, 1 Tbsp. unflavored whey protein, 1/2 tsp. 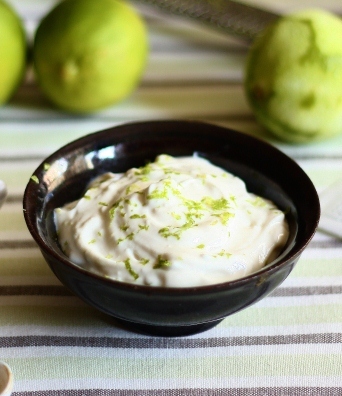 agave syrup, a drop of vanilla extract, the zest of one lime, and a squeeze of lime juice. Then in a small bowl mix 1/8 cup oats, 1/8 cup slivered almonds, and 2 tsp. shredded coconut. In a tall glass, layer together yogurt and coconut-almond oat mixture. 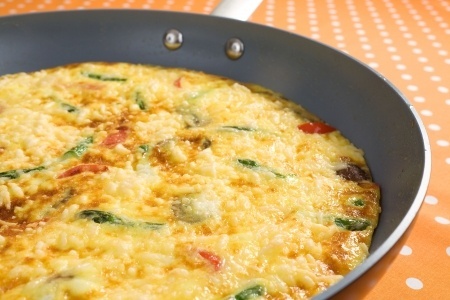 If you want a low-carb breakfast, this is a great option, and the recipe serves 4 so you can feed the whole family or save leftovers for the next day. Begin by preheating oven to 400°F and spraying a muffin tin lightly with olive oil. Then chop 2 Tbsp. sun-dried tomatoes and 4 oz. Applegate Farms turkey salami into thin strips. In a medium mixing bowl, whisk together 9 large eggs, 2 Tbsp. low-fat milk, and 1/4 cup grated Parmesan. Stir in prepared tomatoes and salami, and sprinkle with 1/2 tsp. garlic powder, plus salt and pepper to taste. Divide mixture between 8 standard muffin cups (or large 4-muffin tin). Bake for 10 minutes. Optionally, serve with two slices of sprouted wheat toast for an extra 130 calories, 5 grams protein, and 25 grams carbohydrates. 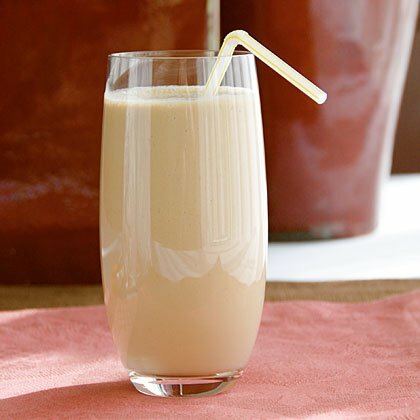 This smoothie has everything your body needs for a morning jump-start. Mix 1/2 cup ice, 1/4 cup milk, 6 oz. plain non-fat Greek yogurt, 2 Tbsp. all-natural peanut butter, 1 tsp. honey, 1 scoop of chocolate whey protein powder, and a pinch of salt in a blender. In a few minutes, you’ll have breakfast ready to swig down or sip on-the-go. 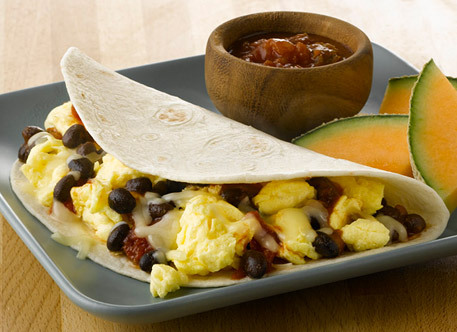 Not only do burritos make a quick meal any time of day, but they can be prepared ahead of time and frozen to ensure you have a healthy breakfast even when too bleary-eyed to see what’s in the fridge. Start be scrambling together 2 egg whites (1/4 cup), 1/4 cup black beans, 2 Tbsp. fresh salsa, and 2 Tbsp. queso fresco (or pepper jack) cheese. Wrap in a spinach tortilla. Serves one, but can easily be scaled to make extras to eat now or save for later. When you’re about to reach for the phone (or Seamless) to order a whole pizza, pull up your bookmarks to locate this recipe stat. This serves one but can easily be adapted for multiple pizzas. You can use whatever you have on hand for toppings, like fresh mozzarella with grilled chicken, or hard-boiled eggs with smoked salmon. Brush two Joseph’s oat bran & whole wheat pitas with 1/2 tsp. olive oil and spread with 2 Tbsp. red pepper hummus. Slice two hard-boiled eggs and half a zucchini to layer on top. Add 1 oz. sliced smoked salmon and 1 oz. feta. Bake for 8–10 minutes or until edges are turning crisp and brown. You might not always have time to make a baked sweet potato in the oven, but in a pinch the microwave will do the trick. Poke a medium-sized sweet potato a few times with a fork before cooking it in the microwave for 3 minutes on high. Flip and continue cooking for 3 more minutes, or until tender. While the potato is getting zapped, mix 4 oz. ground turkey and 3/4 tsp. Southwest seasoning to cook in a small skillet over medium-high heat. Start by heating 1/2 tsp. olive oil, and then brown the meat for 3 to 4 minutes. 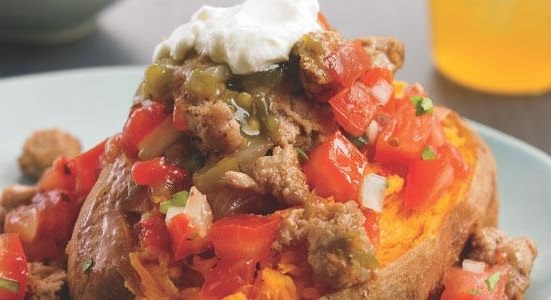 Slice the sweet potato lengthwise down the middle, add turkey, and top with 1/4 cup fresh salsa and 2 Tbsp. plain non-fat Greek yogurt. 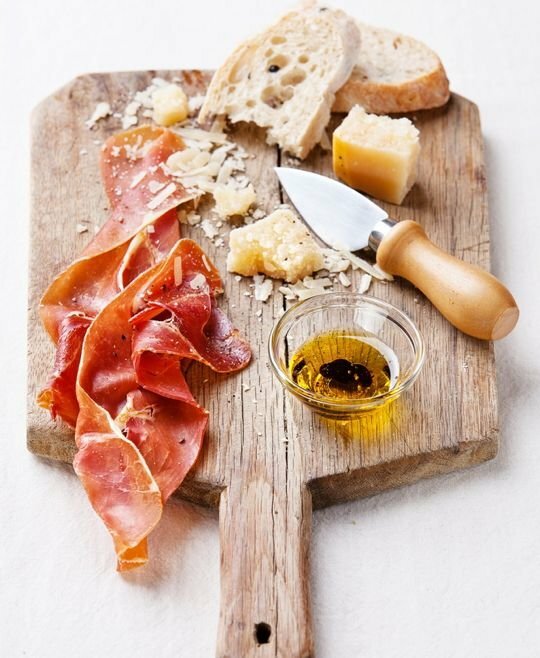 Simple as can be, this lunch course is best eaten by tearing off hunk of fresh bread, flavorful cheese, and meat of your choice and stacking them with the optimal ratio. Anyone can adapt it to suit their tastes. Try using leftover smoked chicken, gruyere, bacon, and onion jam (nutrition facts below). Or stilton (blue) cheese, thin-sliced deli turkey, barbecue sauce, and slices of fresh red onion with whole wheat bread. With 4 oz. of meat, 2 oz. of cheese, and a serving of bread, you can easily put together a healthy lunch. This lunch is small but mighty. It’s high in fat and low in carbs, but the fat comes from healthy whole foods so you can’t go wrong. Cut a medium avocado in half lengthwise and remove the seed. You may need to scoop out some of the fruit’s flesh as well to make a big enough well. 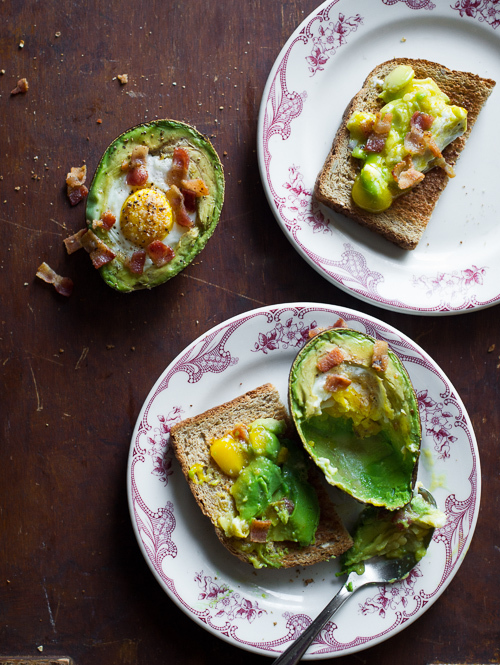 Place in a medium baking dish, and carefully crack one small egg into each avocado half. Cook for about 15 minutes. While the avocado is baking, brown 4 oz. of diced ham in a skillet until warm and crispy, and toast two slices of sprouted wheat bread. Once the egg is firm and set, remove from oven, sprinkle with salt and pepper, and top with ham. Spread the baked mixture onto toast. Serves 2. Thank Jamie Oliver for this decadent quick fix, which serves 4. Mix 1 lb. ground lamb with 1 tsp. garam masala, salt, and pepper. Divide into 16 meatballs. Heat 2 tsp. olive oil in a frying pan, and toss meatballs in oil until the outsides turn golden brown. Remove from pan and set aside. Soak a pinch of saffron in 1/2 cup boiling water while finely slicing one fresh red chili and trimming 2 green onions. Add 1 tsp. olive oil to pan and fry chili, green onions, and cilantro stalks, setting the fresh herb leaves aside. After about 40 seconds, add the saffron water to the pan along with a can of drained chickpeas and a small can of tomato paste. Cover and bring to a boil. Roughly chop and mix 1/2 a cucumber, lettuce, 1 bunch radishes, 2 ripe tomatoes, and 1 lemon. Coat with 1 Tbsp. olive oil. In a small dish, swirl 1 tsp. harissa into 1/4 cup plain nonfat Greek yogurt. 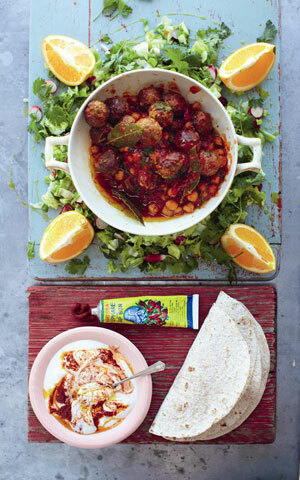 Serve meatballs, salad, and yogurt together with whole wheat tortillas and fresh cilantro. 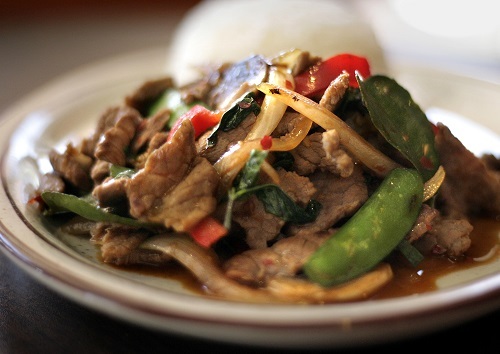 This recipe is so good you won’t even miss the rice. The night or morning before cooking, marinate 4 oz. beef tenderloin in 1/4 cup soy sauce, 1/4 cup olive oil, fresh cut cilantro, and a sprinkle of red pepper flakes and brown sugar. Grill steak until medium-rare and slice into 1/2-inch pieces. Set aside. Sauté pre-cut stir fry vegetable mix until tender, or combine 4 broccoli florets, 1/2 yellow bell pepper (sliced), 1/8 cup bean sprouts, 8 snow peas, 2 cherry tomatoes (halved), and 3 shiitake mushrooms (sliced) in a frying pan over medium-high heat for about 3 minutes. Plate with sliced steak and serve. To start, preheat the broiler, and bring a covered pot of water to a boil. Cut 1/4 cup asparagus into 3-inch pieces. After about 5 minutes, add asparagus and 1/2 cup orzo to the boiling water. Cook asparagus for 3 minutes and orzo for 8 to 10 minutes. While the orzo finishes, prepare a 5 oz. salmon filet to broil for 5 minutes by simply sprinkling both sides with salt and pepper. 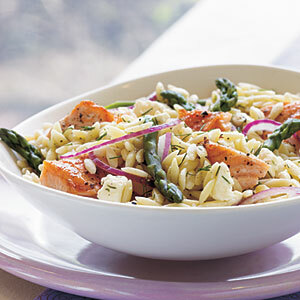 As the salmon and orzo are cooking, combine 1 Tbsp. crumbled feta, 1/4 Tbsp. chopped dill, 1/2 tsp. olive oil, a small squeeze of lemon juice, and a dash of pepper. Flake the salmon into pieces and toss all ingredients together. Spend ten minutes wisely in the morning prepping dinner in a slow cooker, and you and your family can have melt-in-your-mouth beef for dinner. Begin by heating 1 Tbsp. olive oil in a large pan and slicing 5 yellow onions. Lightly season 3 lb. chuck roast with salt and pepper, and then sear it in the pan about 10 minutes, until evenly browned. Remove the meat from the pan before adding 2 Tbsp. red wine vinegar, 1 can of dark beer, and onion slices to the pan. As you stir, scrape the bottom. Add all to a slow cooker with 2 cups low-sodium beef stock, 1 Tbsp. Worcestershire sauce, and 4 bay leaves. Keep on low for 6 hours, or high for 4 hours. 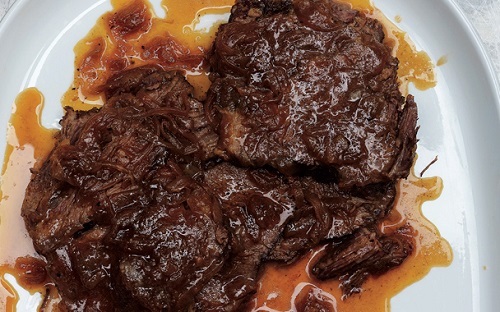 To boost the carb content, sop up the braising liquids with a whole wheat dinner roll. Serves 8. 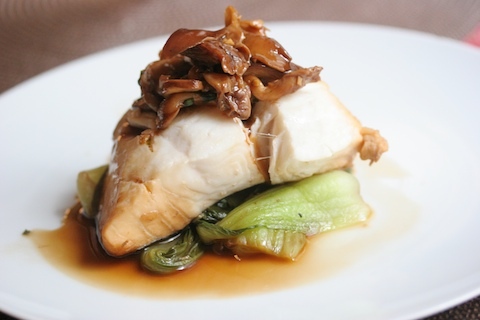 If you don’t have much fat or carbohydrate left for the day, you can get back on track with this recipe for seared halibut. To start, slice a medium onion, 5 cups bok choy, 2 cups shiitake mushrooms (stems removed), and mince 3 garlic cloves, 1/3 cup scallion, and 1 Tbsp. fresh ginger. Add 2 inches of water to a steamer basket and bring to a boil. In a small bowl, mix together 3 Tbsp. lemon juice, 1 Tbsp. soy sauce, 1 Tbsp. olive oil, garlic, scallion, and ginger to make dressing. Lightly season 4 6-oz. halibut steaks with salt and white pepper. Add the onions, mushrooms, and halibut to the steamer in that order. Cover and cook for 3 minutes. Add bok choy and steam for another 3 minutes. Serves 4. 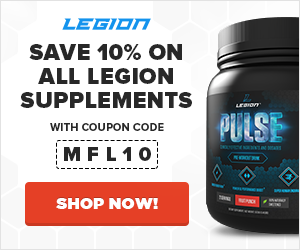 When you’re short on time and need to fill up on protein, chicken breasts are the go-to ingredient to help you get lean meat on the table in 15 minutes or less. Halve and flatten 2 boneless skinless chicken breasts and dust each piece with a teaspoon of flour. Sprinkle with salt and pepper. Heat 2 teaspoons of sunflower oil in a pan until very hot, and fry chicken for 5 minutes on each side. While the chicken breasts cook, prepare salad greens and dressing. In a small bowl, whisk 2 Tbsp. balsamic vinegar, 1 Tbsp. olive oil, 1 Tbsp. honey, and a dash of salt until emulsified. In a large bowl, combine 4 cups baby spinach, 1 cup garlic croutons, 1 sliced cucumber, and 1/2 cup shredded carrots, and toss with balsamic vinaigrette. Once the chicken is finished frying, remove from pan. Add 1/2 cup chicken broth, 1 tsp. crushed garlic, 2 tsp. lemon juice, and 1 tsp. butter to the frying pan, stirring for a couple minutes. Pour over chicken. Serves 4. What did you think of these healthy meals? Have anything else you’d like to share? Let me know in the comments below!